Emily has a very loud voice and her parents and tutor do not know what to do with her. The tutor suggests that she go to a boarding school for quiet girls. Before she leaves for the school, Emily takes a trip into town where she sees a sign for loud help on a ship that is setting sail that day. Emily uses her voice to save several ships from crashing at sea. 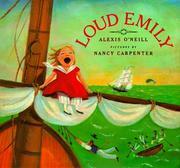 O'Neil, Alexis, “Loud emily,” Children's Picture Book Database at Miami University, accessed April 21, 2019, https://dlp.lib.miamioh.edu/picturebook/items/show/7455.